Do you find it strange that Apple didn’t natively included apps updates from App Store in iOS 5 Notification Center? If this is something you would like your iPhone to do, it now can with a new Cydia tweak called AppUpdateNotifier. This tweak sends you notifications when there’s new app updates in the App Store. AppUpdateNotifier can be configured so it can check for new updates for apps hourly, daily, weekly, or monthly. It can also be configured to ignore updates from certain or specific apps. All of this can be done from the Settings.app, without any additional icons been adding to your home screen. 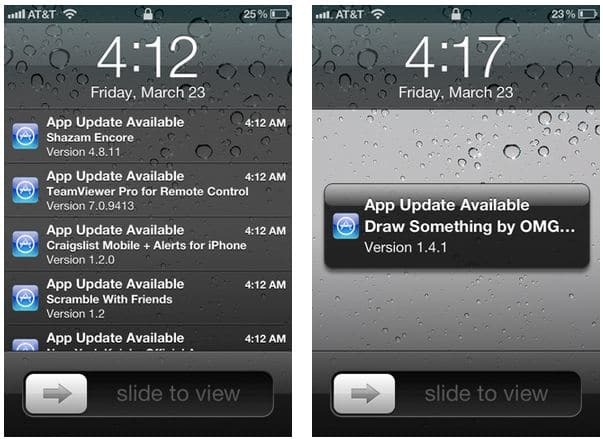 AppUpdateNotifier enables you to automatically receive notifications when new App Store updates are available. You will even receive notifications when your device is locked or asleep. Notifications will be seamlessly presented to you via Apple’s built in notifications system. AppUpdateNotifier even integrates with Apple’s Notification Center to allow you to easily toggle it on or off and manually check for new updates. For some iPhone, iPad, or iPod touch users this tweak is very useful, but for some not. If you really like this tweak and wanna try it, you can download it from Cydia for a price of $1.49.